Our cool down: pulling on Nalgene bottles! "You've been taking some much bigger risks lately, really going for it. I'm proud of you." The bigger the risk, the bigger the reward, right? That's how the old adage goes. Risks can also be dangerous, both literally and figuratively, and really scary. But I'm slowly learning not just to accept the idea that taking a risk in climbing is acceptable, that I probably won't get hurt, but putting it in to practice. And though the intended reward is success, the actual reward from the risk might be better than that. I went to the Philadelphia Rock Gym in Oaks, Pennsylvania last night, easily one of my favorite bouldering gyms of all time. 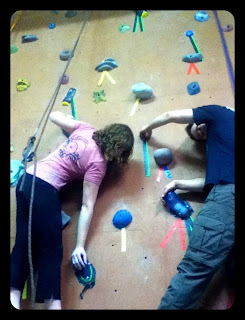 (They made holds on the practice wall out of old Nalgene bottles, pictured above. How cool is that?!) Friend Randy put together a mini-tweetup of sorts, which meant starting the night off with meeting fun new people. That's always a good start to a night. I ended up on the bouldering wall, as usual, and found myself working a V5- route, normally out of my range. The first move was the only one I didn't have to throw for. I shy away from dynamic moves because they're scary, especially high off the ground, but with a giant pile of crash pads and a few phenomenal spotters, I went for it...at least a dozen times. On my final attempt, I made a desperate throw for the finish hold, a giant knobby, slopey mess. My hand hit it, gripped it, then slipped off and I came crashing back down to Earth. One ounce of my being didn't believe I could make it, and that was enough. The landing was epic (by my standards), but safe. I took a risk throwing for the finish, a risk I normally wouldn't have taken. It didn't end with success, but it didn't end badly, and it was actually fun! Dynamic movements are fun and it's one more experience of risk taking that didn't hurt me I can to add to my growing arsenal. And just in time for the Winter Burn bouldering competition tomorrow! Bottom line: Taking risks can be unbelievably rewarding. Duh, right? But even if you fail, the reward you receive for taking the risk might end up being more important than success. I didn't know if I'd make the finish hold, I didn't know if I would succeed, but I trusted crash pads and my spotters and went for it. Unknowns are a huge part of life, but we can't let the fear of failure hold us back. Having someone notice I've been making an effort to do things outside of my comfort zone and telling me about it was an incredible reward. What are some unseen rewards you've received as a result of taking big risks? Tell us in the comments! Good for you for upping your risk-tolerance level. And good luck in the comp; let us know how it goes!